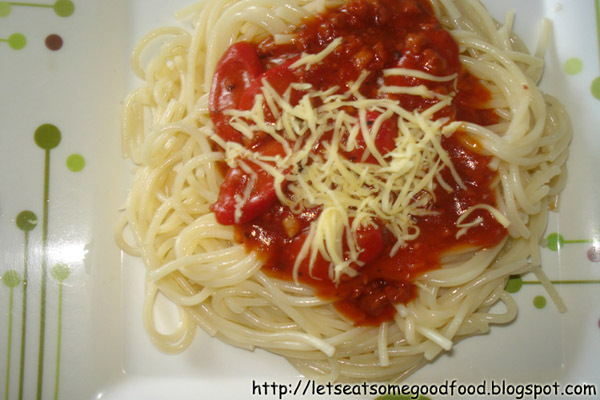 Filipino Spaghetti Recipe – Eats Yummy! Heat cooking oil in a sauce pan and saute garlic and onions. And then add ground pork, bell pepper and a cup of water. Bring to a boil and simmer for 10 minutes. Add the tomato sauce, salt and pepper to taste, then let simmer for another 10 minutes. Add the sugar and hotdogs and continue to simmer for an additional 5 minutes. You may put some hot sauce if you want a spicier dish, only recommended for adults though. i love filipino style spaghetti…yummy! So nice food with your blog! i like it. my spaghetti last sunday was a mess. i overcooked the pasta, and i didn't put sugar. hmmp! now i know.. i'll try this soon! you really have a very tasty meal recipes like .. I support you always ..
Amazing Filipino-style! I like to eat spaghetti, and you recipe so great and yummy! the pasta looks so healthy.. i want to taste it so bad!